Stephen: "Well, we can't rewind to a week ago and put pancake mix on the grocery list"
Me: "Let's go to IHOP"
Stephen: "Come on...we are going out to dinner tonight"
Me: "Ok, I'm going to make a mess of the kitchen....."
1. Preheat pan, or griddle to medium high heat. 2. Sift dry ingredients into a large bowl (flour, sugar, baking powder, and salt). 3. In a smaller bowl whisk together wet ingredients (milk, eggs, vegetable oil). 4. Pour wet ingredients into the larger bowl with the dry ingredients - mix with an electric mixer on a low setting until smooth. 5. Scoop pancake mix onto pan or griddle, place chocolate chips onto each pancake. After a few minutes (when top starts to bubble slightly), carefully flip pancake and cook until finished on the other side - another 3 minutes or so. 6. 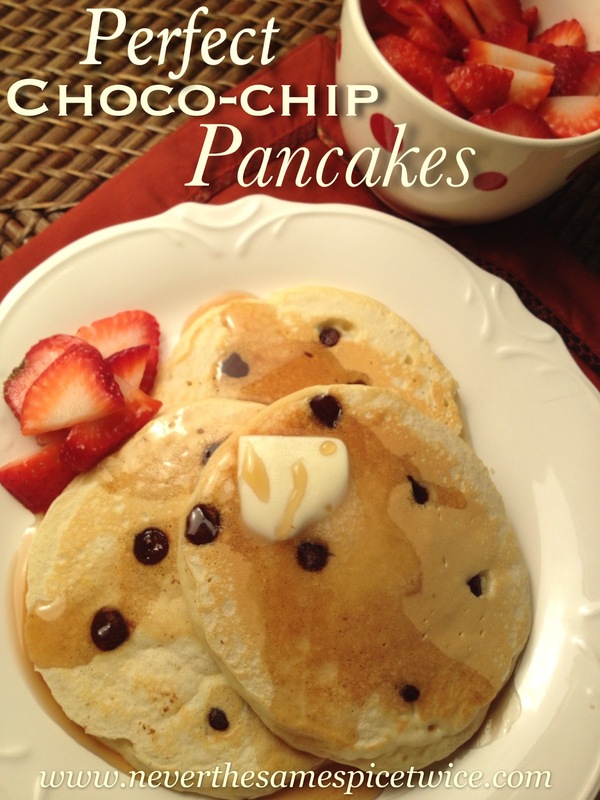 Serve with strawberries, butter, and syrup....and then enjoy the leftovers tomorrow!!! ***Makes 12-16 good sized pancakes!!! We used our awesome Cuisinart Griddler to make these....they came out SO perfect. I love this thing! If you don't have one of these....you need one! The plates reverse to a grill side, AND it folds in half too! So functional!!! These look so perfect & delicious, Stephanie! No time to make them today. We are shoveling out from under 15-30 inches of snow here on Long Island. Maybe tomorrow morning. Mom Sko!!! Good luck digging out, hope you get a chance to try these! Look absolutely delicious. You're blog always have me craving the most random foods. LOVE IT! 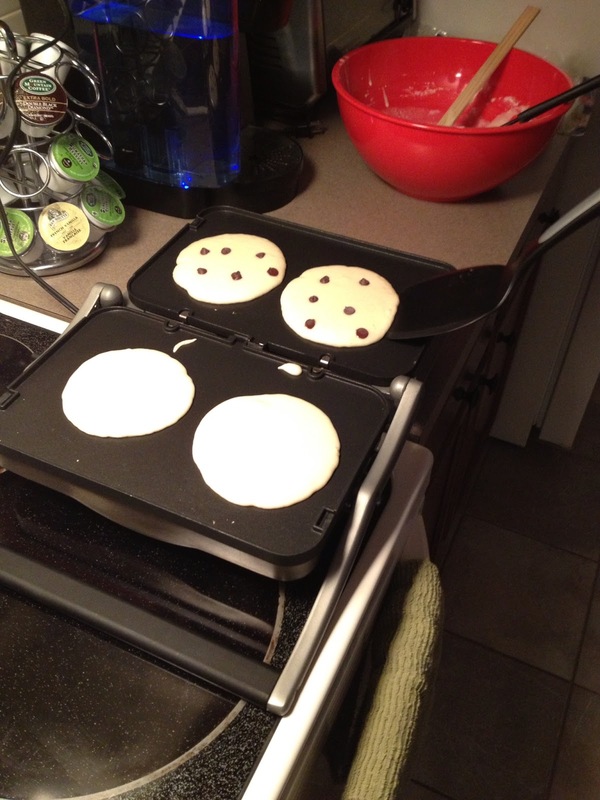 I have the same griddler, but strangely have never though to use it for pancakes... good idea! Those have got to be the most perfect pancakes I've ever seen! This was our first time using it for pancakes....will probably never use a pan again! Thanks for another amazing recipe my cute friend. heehee...we had white choco chip pancakes this weekend too!!! Super yum!!! Ryan's Guest Post & Healthy Giveaway!!! Tiffany and Co. $200 Gift Card Giveaway!!! $250 Victoria's Secret V-Day Giveaway Event!